When out shopping a few weeks ago we came across Santa. 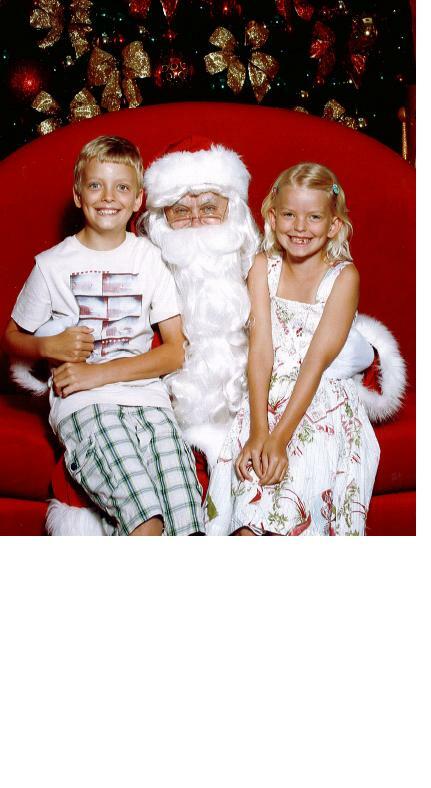 Each and every year I would sit my baby or babies on Santa’s knee at the local shopping centre and pay for a set of prints. The intent was to send out our xmas cards with a copy of the photo to each grand parent. Each year I have been successful at doing so, until December 2010. December 2010 I managed to address the envelopes, carry them on our holiday travelling around central Queensland, but never filled out a single card, let alone post them. This year when the children saw Santa I had a tinge of guilt, remembering last years photo still unsent and the envelopes still stashed in a cupboard somewhere. Did I really want to pay for another Santa photo? Was I going to have time to post xmas cards this year? I am still carrying around the guilt of last year and the envelopes still taunt me when I open up the cupboard. My babies are not babies anymore. Yes I can admit to that cause they don’t look like babies, but they will forever be babies in my heart. All these thoughts were running through my head while each child was tugging at an arm to line up and get a photo with Santa. We made a hasty dash into Pumpkin Patch for some new clothes, a quick change in the toilets and the tiddly peeps were ready for their photo with Santa. These photo traditions have taken on more than sending out a photo to the relatives. My beautiful daughter still believes in the magic and wanted to meet Santa. And my beautiful boy wanted to ask Santa if he would make sure every child got a present this year. The kids are starting to call the shots about what they want for their xmas celebrations. This year we brought our first xmas tree. Don’t ask me how I have managed not to own a xmas tree all these years. I am already looking forward to next years Santa photo and wondering what joys we will share between now and then. One thing I know for sure there will be more planning for xmas day in 2012 because the kids will be organising it. I am going to give them free rein over how they want to spend their festive season. For my extended family and friends we wish you all the joy and happiness over the next 4 days of celebration. My first new year resolution will be – Stop feeling guilty about sending / not sending xmas cards.